(CNN) -- An Austrian man who participated in a Nazi massacre of Jews during World War II and later gained U.S. citizenship has been deported to Austria, U.S. officials said. 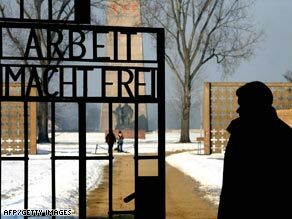 The Sachsenhausen concentration camp just north of Berlin where the U.S. says Krumpf worked as an SS guard. Josias Krumpf, 83, lived for years after the war in Racine, Wisconsin. The United States revoked his citizenship in 2005 after the Criminal Division of the U.S. Department of Justice sought to denaturalize him. Acting Assistant Attorney General Rita Glavin announced Krumpf's deportation Thursday. It was not clear when he arrived in Austria, and representatives of the Austrian Justice Ministry were not immediately available for comment. "His court-ordered removal from the United States to Austria is another milestone in the government's long-running effort to ensure that individuals who participated in crimes against humanity do not find sanctuary in this country," Glavin said. The United States removed Krumpf because of his participation in that and other Nazi-sponsored acts of persecution during the war, Glavin said. Krumpf admits standing watch on November 3, 1943, as SS guards at the Trawniki Labor Camp in Poland shot and killed 8,000 Jews, including women and 400 children, in pits. Glavin said Krumpf said he had orders to shoot any prisoners who survived. Krumpf also served as an SS guard at the Nazi-run Sachsenhausen Concentration Camp in Germany and at slave labor sites in Nazi-occupied France, where prisoners under his watch built launching platforms for German missile attacks on England, Glavin said. The November 1943 shooting was part of a larger Nazi operation called "Aktion Erntefest," or "Operation Harvest Festival," that led to the deaths of 42,000 Jews at three camps in eastern Poland in two days, the Justice Department said. At Trawniki, Krumpf said, he was assigned to watch for victims who were still "halfway alive" or "convulsing" and prevent their escape by shooting them to death, the Justice Department said. Krumpf, who was born in Serbia, immigrated to the United States in 1956 and became a U.S. citizen in 1964. His removal to Austria is part of an effort by several U.S. government departments and law enforcement agencies to identify and prosecute participants in Nazi crimes of persecution who live in the United States, the Justice Department said. The Criminal Division's Office of Special Investigations (OSI) started the operation in 1979 and has since won cases against 107 alleged Nazi criminals, the Justice Department said. The OSI also has a watch list for World War II war criminals that has prevented the entry of more than 180 people into the United States, the Justice Department said.